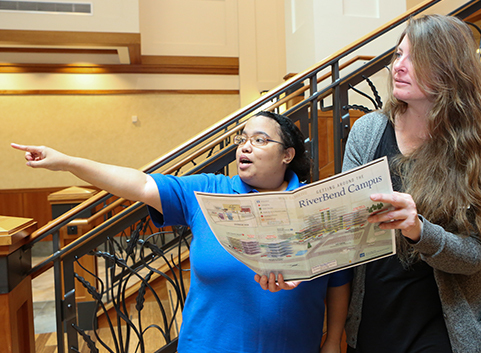 This nationally acclaimed nine-month internship program provides employability training and education for individuals with cognitive disabilities. The program occurs onsite at a business which has the commitment to support people with disabilities in the workplace. Interns begin the academic year with two weeks of classroom instruction to prepare for the initial internship placement. Once the internships begin, interns spend six hours onsite with an hour each day in the classroom working on the topics listed below and return at the conclusion of the work day to debrief about their day, ask questions and receive coaching. The end goal is to secure employment, utilizing the skills gained during the program. How do interns grow within Project SEARCH? Interns learn the importance of being responsible and independent by learning how to take public transportation to work and working in an integrated setting. We work together on social and communication skills that are critical for a workplace through real life examples and role play. We match intern interests with internship opportunities. We monitor intern comfort levels in the workplace and provide supports as needed. We work together to prepare for interviewing and keeping a job. What is the academic year like for the interns? The internship runs from September–May. Two weeks are spent in the classroom during orientation and transition into three, ten or eleven week internships at PeaceHealth SHMC at RiverBend or University District, Hilton Eugene, or another business site. Breaks are spent in the community working on job search related activities. Willing to work and learn on the job. Willing to work toward independence including living, transportation and gaining competitive employment. Commit to a nine-month unpaid internship with intent to participate fully in the program. In final year of school eligibility or transitioning out of vocational programs, verified disability, 18 years of age and with a funding source. Current immunizations, ability to pass drug screening and background check, TB test and receive the flu shot. Talk to your teachers, case managers, vocational rehabilitation counselors and family to make sure this program is right for you. Complete the application with your counselor and family by the deadline. Attend an Open House & ask questions of the staff and current interns. Complete an interview with the Project SEARCH Committee. Contact us to learn more about Project SEARCH. The independence and progress our son has made has been so rewarding and it has been a true blessing to both him and our family. We truly appreciate the wonderful staff who have dedicated their time to make this program a success. We would highly recommend Project SEARCH. Project SEARCH is a partnership between Pearl Buck Center, PeaceHealth SacredHeart Medical Center, Hilton Eugene, Oregon Vocational Rehabilitation Services and the Oregon Department of Human Services. Special thanks to SELCO Community Credit Union for sponsoring the Hilton Eugene site.